This month's photo is absolutely stunning! 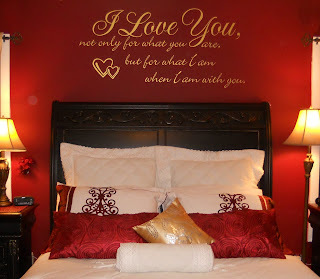 Danielle contacted us and wanted to use this beautiful saying in her bedroom. She also wanted to include those two adorable hearts (a tattoo she and her husband share). What a perfect example of taking a quote and making it your own. We always love to help with these projects. Congrats to Danielle for her winning photo. She'll be receiving a $50.00 gift certificate this month. Be sure to send us your photo for a chance to win our monthly contest.